I'll begin with a quick overview of the six stories, then move on to commenting on the whole. Hogarth has written a lot about the Pelted, and if you're not sure where to begin reading, she recommends starting with "A Distant Sun". It turns out to be the first story here, an excellent choice. A new history teacher arrives at a high school and engages his senior class to teach them about the origins of the Pelted. This includes uncomfortable truths about the moral choices and mistakes that their ancestors made, and the difficulties in moving on from a checkered past. While this is going on, the teacher is also trying to move on from his own past, little realizing (at first) that one of his students suffers from a similar burden. This story is the longest work in the book (about 30% of it), and was my personal favorite. Great storytelling! The second story, slightly shorter (but not by much) is "Rosettes and Ribbons" – previously published in Best In Show: Fifteen Years of Outstanding Furry Fiction, where it was again my favorite, by quite a wide margin. (And I say this as one of the other contributors!) A young anthropologist is brought in to help at an archeological dig, only to find herself attracting unwanted attention and getting caught on the bad side of a dispute between two locals, which could result in her death. Man, did I want to give one of those characters a smack; a very believable antagonist. The third, fourth and fifth stories in the book are all fairly short; I must admit a slight bias that I tend to prefer the author's longer narratives. "The Elements of Freedom" involves a seismologist who must convince a tribal group to leave their territory before an impending earthquake, but can only gain their trust by undergoing a rite of passage. Next, in "Pantheon" a woman becomes a cadet on a starship to escape the traditional gender role her family expects. Fiercely ambitious, she gets the attention of the ship's commander by challenging him to a tabletop card game. Their egos are both at stake – neither are used to losing, and to make it more difficult, they play with a new expansion pack that neither of them have ever used before. "Tears" is about a young, morose woman whose caring boyfriend gently tries to lift her spirits. The shortest work in the book, it manages to be upbeat in its own, simple way. Very tender. The last story, "Butterfly", is of medium length compared to the others. I had a strange sense of déjà vu; maybe I'd read it in Anthrolations. If so, I'd largely forgotten it, so it was like reading it for the first time. Following the death of their authoritarian father, two siblings of noble birth welcome back their long-lost sister, who knows nothing of her origins. Experiencing culture shock, she's unsure what to make of the castle and the way of life she could inherit and share with her somewhat religious brother and sister. This was an okay read; I must be honest in that I was a bit put off at how the main character didn't actually have much character; she was like a blank slate. I suppose this was to done to accentuate her unfamiliarity with her surroundings, but you can't have culture shock without having another culture to compare it against, and this wasn't adequately supplied. Still, on the whole I liked both the story and the ending. The opening paragraphs of "Butterfly" also contained a barrage of unknown terminology. Most was explained over the course of the story, but the beginning left me with the notion that I didn't quite understand what was going on. This was the only story in the collection with this problem, and this topic leads me into my general commentary, starting with story universes. Whenever an author creates a large, detailed story universe, there's always the risk of not giving the reader enough information to fully appreciate the setting. Like the political conflicts in the original Cerebus comics (which are never explained), or some of the Jack Salem comics where there's no backstory nor introduction to the world in general. Good news; in Hogarth's Claws and Starships, except for the opening bit of that last story, none of the other works had this problem. It was helped a great deal by "A Distant Sun" being an excellent introductory piece. "Tam-illee"? One paragraph later, the word "vulpine" was used to clarify. I've gotten the context, and as a reader this makes me very happy! Sure, you get the sense that there are probably little nuances you might be missing, but you don't feel like you're being left out of the story. On the contrary, Hogarth is very skilled at drawing the reader into the story. In fact, there's a very strong sense of intimacy to her writing. You feel like you're getting up close to the characters (the stories are largely character-driven), even if nothing intimate is going on. It feels very personal, and I enjoyed that. On a more abstract note, my undergrad major was in anthropology, and these stories really resonated on that level. Trust me, you don't need to know anything about anthropology to enjoy this book, but if you do, it really comes through whenever one character's culture interacts with that of another – one of this collection's running themes. I think this is the main reason I originally liked "Rosettes and Ribbons" so much. It's also very present in "Butterfly" and "Pantheon", the latter of which was interesting because the main character brings whole psychological chunks of her culture with her when she leaves home. "The Elements of Freedom" oddly felt too anthropological to me, a bit textbookish and overdone. It's hard to put into words; my background did me a disservice here. Overall however, despite these nit-picks, each story drew me in and they were all good reads; especially the first two, which made up the majority of the book. I enjoyed the theme of many characters becoming bolder, coming into themselves as individuals and feeling more self-assured. I passed a very pleasant afternoon reading this! Each story is introduced with an illustration, all drawn by the author (plus the front cover art). Fred Patten's afterword provides an overview of her publishing history and a quick bio. M.C.A. 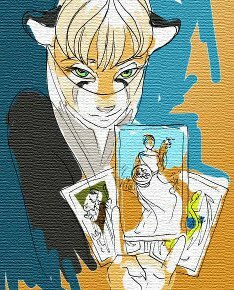 Hogarth is among furry fandom's best writers; if you want a casual introduction to her writing, this collection fits the bill perfectly, without needing to know about any the other branches of this story universe, such as the elfin Eldritch or military-themed works. It's great to see her able to cross into different genres of SF so fluidly, and her talents have attracted positive attention from the general science-fiction community. In fact, several well-known SF authors, high-profile fans and organizations recently came to her aid when Games Workshop unjustly blocked access her work (claiming trademark infringement), and were successfully fought back! 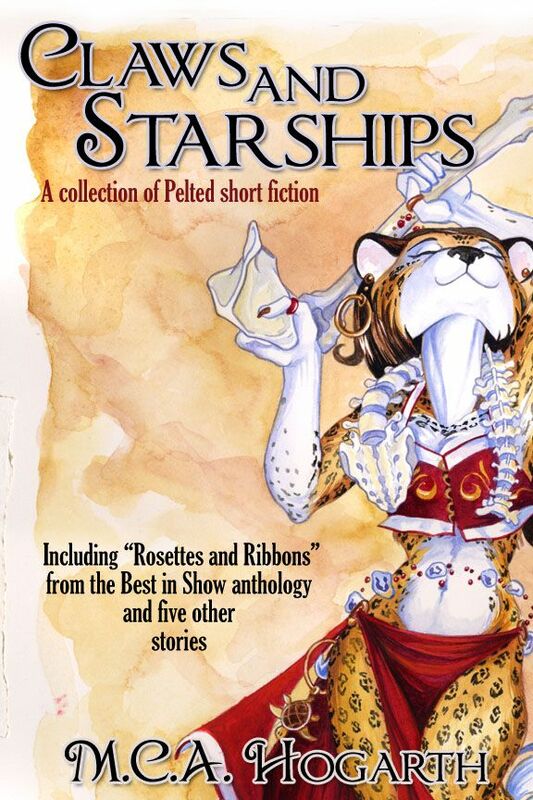 So yep, I'd say give Claws and Starships a try; you can browse a good-sized sample of the beginning at Smashwords (click on the green arrows). Thanks for spreading the word of GOOD fuhreh fiction.